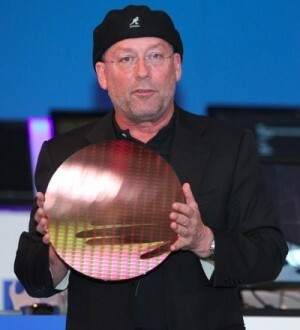 Update (2/27): Even more contradicting information on the Intel Ivy Bridge saga has come to light this past weekend. Sean Maloney, executive VP of Intel, told the Financial Times that the upcoming processor would not be shipping in April but some time between May and June. The only part where everyone seems to agree on is that whenever time comes, Intel won't have much in the way of competition for their latest processors. Intel had previously given an ambiguous “spring” launch estimate, with many believing the firm would ship the chips earlier rather than later, with some even predicting a mid-to-end March arrival. Many of you were bummed about the delay of Intel's next-generation processing architecture, but as it turns out, the rumor might only be partly accurate. DigiTimes reported last week that volume shipments of Ivy Bridge were pushed from April to June so notebook vendors could flush their existing Sandy Bridge parts. VR-Zone now has it on good authority (no sources named, however) that only dual-core mobile chips are delayed, while quad-core notebook CPUs and all desktop parts remain on track for April. In less speculative developments, Intel's Scott Siers and Dadi Perlmutter spoke at the International Solid-State Circuits Conference (ISSCC) in San Francisco, revealing a few new details about Ivy Bridge among other technologies. During his keynote, Siers said Ivy Bridge has 20 PCI Express 3.0 interconnect lanes (up from Sandy Bridge's 16 lanes) as well as an integrated DisplayPort controller, which supports three screens including one 1.6GHz and two 2.7GHz links with four lanes each, says EE Times. This is Intel's first client chip to support 1.35V DDR3L and DDR power gating in standby. The architecture can handle up to 1,600MTransfers per second in addition to 1.5V DDR3. Ivy Bridge has a new write assist cache circuit that provides a 100-millivolt power reduction. The x86 cores can run in data rates of 100Mhz while its GPUs scale in 50MHz increments. Overall, the chip can handle five power planes and 180 separately gated clock islands. It remains to be seen how much of a performance boost the 22nm parts will bring, but EXPreview has published tests of a Core i5-3570K engineering sample. The site compares Ivy Bridge's HD Graphics 4000 core with the Core i5-2500K's HD Graphics 3000. Unsurprisingly, there's a noticeable improvement. The site reports a 71.59% jump in frame rate when running Left 4 Dead 2 at 1280x720. At the same res with medium-high settings, there's a 30-85% boost in StarCraft 2, Dirt 3, Street Fighter IV and Far Cry. All of those games ran at playable frame rates with SC2 being the lowest at 29.3fps (fine for a real-time strategy title). Unfortunately, compared to the entry-level GeForce GT 240 1GB, the HD Graphics 4000 still looked fairly anemic. On average, the discrete Nvidia card pumped nearly 36% more frames with more than 60fps in all but one of the games (Far Cry at 51.6fps). EXPreview also ran 3DMark 11 to test the GPU's DX11 performance. The total score was only 1478 with frame rates largely in the single digits.